Take ordinary cod, grilled to perfection, and serve it with this refreshing mango orange chutney, and you have a delicious and healthy dinnertime entrée that is sure to become one of your favorite fish recipes. Enjoy these tenderloin medallions paired with the sweet taste of apples. Serve medallions with hot couscous and steamed broccoli. This pasta dish will definitely feed a crowd. 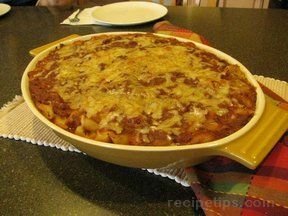 Make it in advance so it is ready to put into the oven when you get home from a hectic day. Serve with a side salad and garlic bread. In addition to being a terrific menu item for a picnic, this great salad, filled with a variety of tasty, bite-sized morsels, can be enjoyed as a complete meal for a light supper. To make these kabobs more colorful, try a combination of red, yellow and green peppers. Instead of using a large onion, cut up green onions. Serve with beans and rice. Finish off the meal with a bowl of sorbet with sliced fresh fruit. Satisfying chicken dish with an intense fruit flavor and a touch spiciness.